“We are one big family” is how Al Crnjac describes Fibrenew as a company. 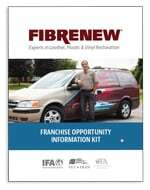 Crnjac owns two Fibrenew businesses: Fibrenew Eastern Ontario and Fibrenew Ottawa which combined, have 5 technicians who service over 1.2 million people. Al has built his business on providing exceptional leather, plastic and vinyl restoration service across automotive, residential, commercial and marine markets in his territories. In this video, we show a day in the life inside his business and capture some of his comments on his history and experience with Fibrenew.